We all like to be loved and accepted by other people. But there is something more important than this. What is it? It is being loved and accepted by God! 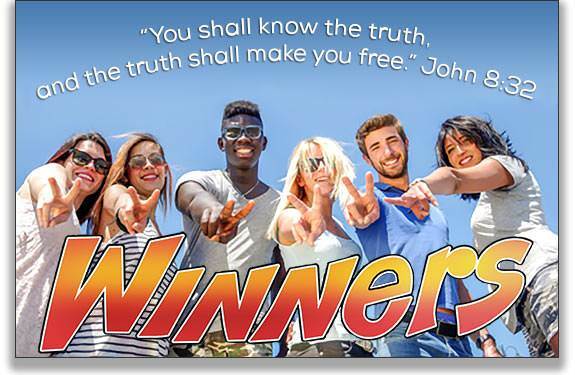 • How does God see every person? • What did God do to make me perfectly accepted by Him? • What does God want every Christian to know? How does God see every person? God sees every person as being "in Adam"—in Adam's sinful family, or "in Christ"—in Christ's family. God could not accept me when I was in Adam's family. But God loved me and He did something wonderful for me when I took Christ as my Savior. He made a way for me to be perfectly accepted by Him at all times. How did God make me acceptable? The moment I received Christ as my Savior, God put me in Christ. What does it mean to be in Christ? It means that I have a new "position" in God's sight. My "position" is the way God sees me. Before I was saved, God saw me as being in Adam. But now God sees me in Christ. The Bible says, "But of Him [God] are you in Christ Jesus…" (1 Corinthians 1:30). How did I get into Christ? God put me there! I could never do this myself, but God did it for me. By His mighty power God took me out of Adam's sinful family and put me into Christ's family. He put me in Christ. The most precious phrase in the whole Bible is the little phrase "in Christ." Over and over again, the Bible speaks of those who have trusted Christ as their Savior as being in Christ or in Him. God wants His believers to know that they are in Christ! To be in Christ means to share in all that Christ did and all that He is today. To be in Christ means that I have a new "position" before God. I am loved and accepted perfectly by God because I am in Christ. God wants every Christian to know that he is in Christ. As you read the New Testament, watch for the words, "In Christ," or "In Him." You will discover that they are used many times. In fact, they are used over 130 times in the New Testament. God wants me to know that I am in Christ! "Therefore if any man [anyone] is in Christ, he is a new creation [a new person]: old things are passed away; behold, all things are become new" (2 Corinthians 5:17). Because I am in Christ, God has forgiven me of every sin—past, present and future. The Bible says, "In whom [in Christ] we have redemption through His blood, even the forgiveness of sins" (Colossians 1:14). As a sinner, I was separated from God and could not come into His presence. But now in Christ Jesus, I can come boldly into God's presence because the blood of His Son Jesus Christ has cleansed me from all sin. The Bible says, "But now in Christ Jesus you who sometimes were far off are made near by the blood of Christ" (Ephesians 2:13). To redeem something means to pay a price to get it back. Because of Adam's disobedience, we were "stolen" from God by Satan. But Christ has redeemed us. He has "bought us back." Now we belong to Him, the One who redeemed us. The Bible says, "In whom [in Christ] we have redemption through His blood…" (Ephesians 1:7). Christ had to pay a great price to redeem us. What was the price He paid for us? The price was His precious blood. He died on the cross to get us back. The Bible says, "…you were not redeemed with corruptible things, as silver and gold…but with the precious blood of Christ…" (1 Peter 1:18-19). 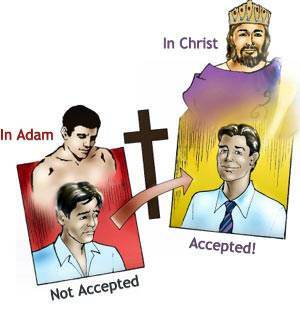 God could not accept me when I was in Adam, in his sinful family. 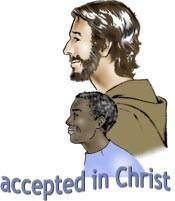 But the moment I received the Lord Jesus as my Savior, I was accepted by God. Why am I accepted by God? Because I am in Christ! The Bible says, "To the praise of the glory of His grace, wherein He has made us accepted in the Beloved [in Christ]" (Ephesians 1:6). The Bible speaks of my "position" in Christ and my "walk" with Christ. 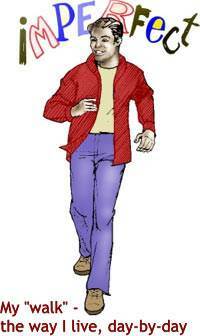 I need to know the difference between my position and my walk. What is my "position" in Christ? My position is the way God sees me. Before I was saved, I was in Adam's sinful family. God saw me as being in Adam. In Adam I was not acceptable to God. The moment I took Christ as my Savior, God took me out of Adam's sinful family and put me in His new family. I am no longer in Adam; I am now in Christ. I now have a new position in God's sight. God now sees me in Christ. He loves me and accepts me in the same way that He loves and accepts His own beloved Son. Can I lose my position in Christ? No, I cannot. My position in Christ depends on who Christ is. 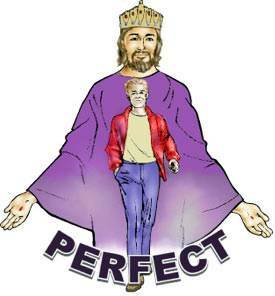 Because Christ is perfect, God always sees me as perfect in Christ. When I sin, I lose the joy of fellowship with the Lord, but I never lose my position in Christ. God always accepts me according to my position in Christ, and not according to my walk. This does not mean that I can be careless about my conduct. Sin causes me to lose the joy of my salvation. When I realize that I have sinned, when should I confess that sin to God? I should confess that sin immediately! If my sin involved another person, I should ask their forgiveness. When I do this, God forgives me and restores my joy. or "in Christ"—in Christ's family. When I took Christ as my Savior, God took me out of Adam's sinful family and put me in Christ's family. I am now in Christ. God always accepts me according to my position in Christ, and not according to my conduct. God always sees me in Christ. I am always loved and accepted "in the Beloved"—in Christ. 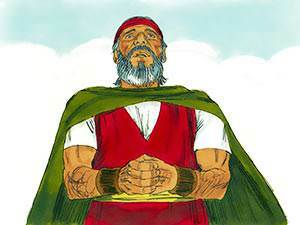 When Moses was 40 years old, he went out to his people, the children of Israel. He saw their hardships. 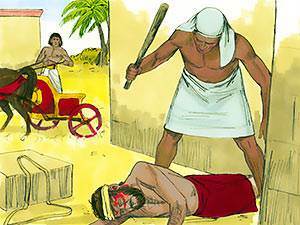 One day he saw an Egyptian slave master beating a Hebrew, one of his brethren. Moses killed the Egyptian and hid his body in the sand. Moses chose to identify himself with the children of Israel, a race of slaves at that time. The Bible says, "By faith Moses, when he was come to years, refused to be called the son of Pharaoh's daughter; choosing rather to suffer affliction with the people of God, than to enjoy the pleasures of sin for a season" (Hebrews 11:24-25). When the Egyptians discovered what he had done, Moses had to run for his life. He went into the land of Midian and lived there with the priest of Midian. Moses became a shepherd. The priest of Midian gave one of his daughters to Moses to be his wife. 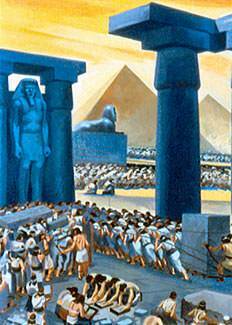 In Egypt the children of Israel were slaves of Pharaoh and idol worshippers. They were bowing down before Egypt's gods. They had hard, merciless taskmasters who beat them daily with whips. Yet they had their little pleasures. Pharaoh allowed them to have fish, cucumbers, melons, onions and garlic. This helped make them content to remain in Egypt as Pharaoh's slaves. This is a picture of every unsaved person. He is a slave of Satan in Satan's world system. Yet, Satan allows him to have his little pleasures in the world because they help to keep him content to remain Satan's slave, in Satan's world system. Because of their great suffering, the children of Israel cried out to God, and God heard their groanings and their cries. God appeared to Moses in the wilderness and said, "I am come down to deliver them." How did God deliver His people? He gave them a deliverer—Moses. Moses was raised in the royal palace as the son of Pharaoh's daughter. He was in line to become a ruler of Egypt. He had everything that this world could offer him, but God called him to identify himself with the children of Israel, a slave race. Moses refused Egypt's greatness, wealth and pleasures, and chose to obey God. Pleasing God and obeying Him was more important to Moses than "enjoying the pleasure of sin for a season." The Bible says, "By faith he forsook Egypt, not fearing the wrath of the king: for he endured, as seeing Him [God] who is invisible" (Hebrews 11:27). It pleases God when we, like Moses, refuse the sinful pleasures of this world and choose to serve Him. God has great rewards for us in the next world.